On October 2, 2016, the Internal Revenue Service released its anticipated proposed regulations concerning the valuation of interests in corporations and partnerships for gift, estate, and generation-skipping transfer tax purposes. Specifically, the proposed regulations concern the treatment of certain lapsing rights and restrictions on liquidation in determining the value of the transferred interests. Further, the proposed regulations affect certain transferors of interests in corporations and partnerships, and the proposed regulations are intended to prevent the alleged undervaluation of such transferred interests. This discussion outlines the proposed regulations. And, this discussion describes the implied business and security valuation issues and implications if the proposed regulations are finalized in their current form. 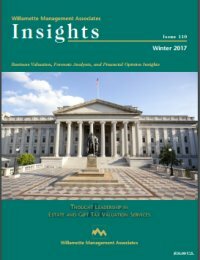 A previous discussion of the Estate of Giustina v. Commissioner case was presented in the summer of 2015 Insights issue. At that time, the case was on appeal to the U.S. Court of Appeals for the Ninth Circuit. The Ninth Circuit reversed and remanded the case back to the U.S. Tax Court for recalculation. This discussion summarizes the original facts presented in the case and the updated findings concluded by the U.S. Tax Court in a supplemental memorandum opinion on June 13, 2016. A transfer was made in 1972 and a federal gift tax deficiency notice was issued in 2013. How did that happen? What are the valuation issues? The issues addressed in this discussion include (1) the remoteness of prior transactions in a subject company’s stock used as indications of fair market value, (2) how the fact pattern surrounding a transaction can support whether it meets the fair market value standard, (3) the timeliness of deficiency determination notices, (4) what makes a gift a gift, and (5) an unnecessary examination by the Internal Revenue Service (the “Service”). From a noncontrolling investor’s perspective, closed-end mutual funds serve as a unique benchmark for measuring a discount for lack of control related to closely held investment management companies. This benchmark measures the market-implied price discounts compared to a closed-end fund’s net asset value. Beginning with a core understanding of the characteristics and variations of closed-end mutual funds, the rationale for marketimplied valuation discounts will be presented, along with an overview of the methodology and the procedures that analysts often use to quantify a discount for lack of control using closed-end fund pricing data. Proposed regulations under Internal Revenue Code Section 2704 introduce the use of a sixmonth put option to estimate the discount for lack of marketability of business ownership interests for gift, estate, and generation-skipping transfer tax transactions. This discussion outlines the various put option models often relied on by valuation analysts to estimate the discount for lack of marketability. In estimating the value of a promissory note that a family or family limited partnership issued, there are no safe harbor guidelines provided by the Internal Revenue Service (the “Service”) with regard to appropriate market interest rates, discounts, or methodologies, except for Revenue Ruling 67-276. Revenue Ruling 67-276 states that “the existence of an over-the-counter market for such securities and the quotations and opinions of value provided by brokers and real estate appraisers will not be accepted as conclusive evidence of the fair market value of such securities.” This Revenue Ruling also indicates that the proper way to value promissory notes is to consider all available financial data and all relevant factors affecting the fair market value.1 However, this indication is too broad for valuation analysts to apply in estimating the value of a promissory note. This discussion (1) examines relevant regulations and judicial decisions and (2) describes the promissory note valuation methodologies covered in the relevant judicial decisions and finance literature. A valuation analyst may be retained to value a wide variety of companies for gift and estate tax planning, compliance, or controversy purposes. Such companies may offer unusual products or services (i.e., atypical companies). Regarding the application of the market approach and guideline publicly traded company method in the valuation of an atypical company, there may be an absence of guideline publicly traded companies with products and services that are sufficiently comparable to those of the atypical subject company. In these instances, the analyst can either (1) reject the application of the guideline publicly traded company method or (2) broaden the selection criteria to related industries. Two Tax Court decisions have outlined lists of factors to consider when analyzing the comparability of guideline publicly traded companies. Additionally, several Tax Court decisions have provided insight into the degree of comparability accepted by the Tax Court. The analyst should consider these Tax Court decisions and selection criteria when applying the guideline publicly traded company method in the valuation of an atypical company. High net worth individuals seeking a tax-advantaged trust structure to assist in charitable gift and estate tax planning may use a net income with makeup charitable remainder unitrust (NIMCRUT). The NIMCRUT structure may appeal especially to (1) individuals who have assets with significant embedded capital gains, (2) individuals who intend to donate a substantial sum of money to charity upon their death or at another time in the future, and (3) individuals who desire an income stream for themselves or their loved ones for life or for a specifically defined future period. When performing the valuation of an interest in a NIMCRUT, an analyst should follow specific procedures determined by the Internal Revenue Service. However, a better understanding of NIMCRUT-specific factors and how they affect valuation will assist the analyst in performing these procedures efficiently and accurately. This discussion provides analysts with (1) a basic understanding of what a NIMCRUT is (to assist them in their NIMCRUT-related valuation analysis) and (2) a stepby- step process for the accurate valuation of interests in a NIMCRUT in accordance with the Treasury regulations. Valuation analysts (analysts) may serve as financial advisers to the parties of merger and acquisition (M&A) transactions. And, analysts may be asked to opine on the fairness of the M&A transaction price and/or structure. Such analysts are not necessarily income tax experts. However, analysts should consider the taxation aspects of the transaction structure in their financial advice or transaction fairness opinions. Valuation analysts (analysts), forensic accountants, financial advisers, and related professionals are often called on to provide valuation and other financial opinions within a commercial bankruptcy context. These opinions often involve analyzing when a debtor company enters the zone of insolvency, assessing the debtor company solvency or insolvency, determining the value of a creditor’s security interest, concluding the fairness of a proposed sale or financing transaction while the debtor is in bankruptcy protection, determining whether a proposed plan of reorganization is fair and equitable, or providing the fresh-start accounting asset and liability values for a reorganized debtor company that is exiting bankruptcy protection. Many valuation analysts automatically apply income approach or cost approach methods in the valuation of intellectual property (IP) within a commercial bankruptcy environment. This discussion describes and illustrates the market approach methods that may also be used in the bankruptcy-related IP valuation.